Range Rover Sport DVD Headrest - Once fitted the system offers incredible value for money. The system is designed to replace your factory installed headrests with custom designed headrests that house 7 inch HD screens. Of course the material of the Range Rover Sport DVD Headrest are an exact match of the factory leather. 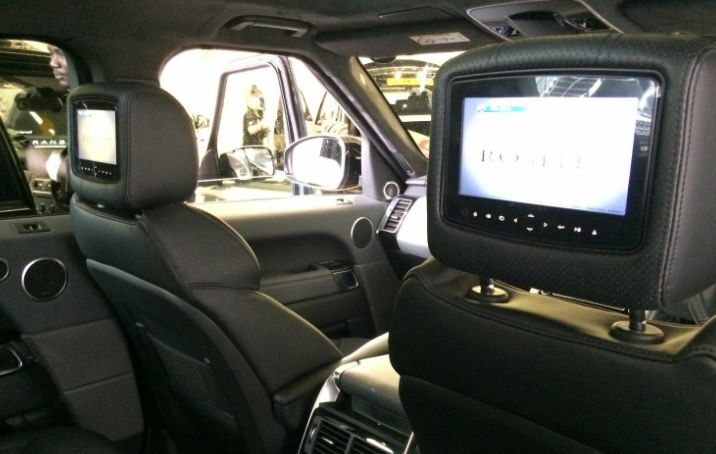 Each headrest of our Range Rover Sport Headrest has the choice of video source, for example you can have DVD, iPod Dock, or simply just a monitor which can display the images produced by the video source built in to the other screen. We offer Range Rover Sport DVD Headrest professionally installed in all vehicles. The Range Rover Sport & Range Rover Evoque vehicles are by far our most popular vehicles with the Audi Q7 not far behind. Each Range Rover Sport DVD Headrest in Leeds is professionally installed by one of our mobile engineers who ensure you have a full understanding of the product once fitted. The Range Rover Sport and Evoque DVD headrests come with 50 arcade style games built-in , an auxillary input for connection of an external games console along with a FM Modulator to seamlessly transmit any audio through your vehicles audio system. These Range Rover Sport DVD Headrest are available for fitting throughout Yorkshire in areas such as Wakefield, Pontefract, Castleford, Dewsbury, Leeds, Huddersfield, Bradford, Sheffield, York, Hull, Goole at a location to suit you.